In 2016, we said farewell to Mrs Sandra Shaw who has been involved with helping international students at Manurewa High School for many years, first as the deputy principal overseeing the running of the department and, after she retired from that role, returning as the teacher in charge. 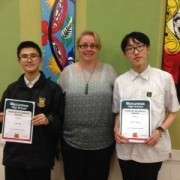 Mrs Shaw was passionate about building up the number of international students at Manurewa High School and also about ensuring that the quality of care and academic opportunities offered to these students was second to none. Many of the students who are leaving this year will remember her kindness, her motherly nagging and her lessons in the polite way of doing things! She left at the end of Term 2 to enjoy a well-earned, "it’s real this time", retirement. We wish her all the best. Stepping into Mrs Shaw’s shoes has been a learning experience. Even though I have been a teacher at Manurewa High School for more years than I can remember, being responsible for the international students is a very different role. However, with guidance from Mrs Bossenger and the amazing administrative assistance of Mrs Ball (plus the odd emergency call to Mrs Shaw) I have made it through to the end of the year! We have welcomed several new students this year (Jervis Deng, Kim Jin and Janessa Wang from China, Olga Pisi from Papua New Guinea, and Ravikesh Nadan from Fiji) and also farewelled a couple (Jack Chen from China, and Anastasia Leonidova from Russia). At the end of the year we will be saying goodbye and good luck to our year 13 students (Miew Viriyaarcha from Thailand, Lucy Nguyen from Vietnam, Apan Grewal from India, and Rotanakoudom Seng from Cambodia) as they leave to continue their New Zealand education at tertiary level. Aditep Rintha from Thailand, Jezebel Cristofari from Italy, and Jessica Wu from China who all began Manurewa High School in 2015 will continue their studies here next year as well. We are a truly diverse whaanau. Some of the highlights of the year have been a trip to Goat Island and Sheep World, where Jack tried his hand at sheep shearing. There have also been ten pin bowling matches (Most Stylish Bowler awarded to Jervis), restaurant visits, and Olga and Miew had an adventurous time as guests on the Geography trip to Rotorua. An international barbecue with homestay families and a trip to the Sky Tower are planned for the end of the year. 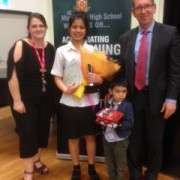 On an academic high note, we must congratulate Jezebel Cristofari who was awarded the top accolade for Excellence in the Health Science Academy. 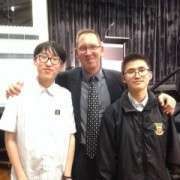 Our students from Yichun in China were also excited to show their Principal, Director of International Students and the Chief Inspector around Manurewa High School when they flew in for a four-day visit to New Zealand. They took them on a tour of the school and shared a magnificent lunch at Manners Café with them. The visitors were impressed with the variety of subjects offered here at Manurewa High School and the flexibility of our teaching/learning styles. Overall, I must acknowledge what a wonderful group the international students are. They deal with the trials and tribulations of everyday student life along with the added challenges of learning a new language and living away from their home country and their families. For those of you leaving Manurewa High School, we wish you all the best. And remember that once you are part of the MHS whaanau, you are always part of the MHS whaanau - no matter where in the world you come from or end up. 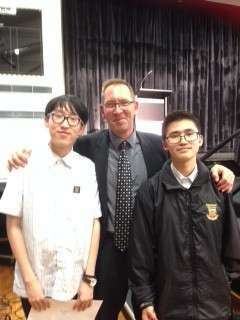 Left: Jervis and Kim with the Principal Pete Jones. 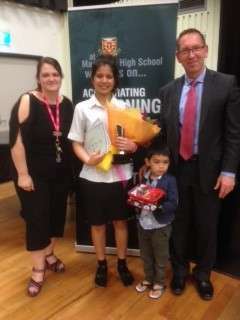 Middle: Jezebel Cristofari receiving an Excellence Award for Health Science from teacher in charge Nicole Stevens and the Principal Pete Jones. 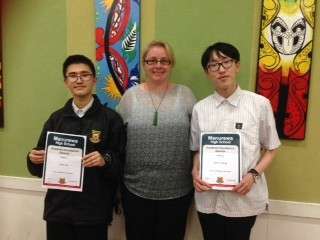 Right: Jervis and Kim receiving certificates for Merit Endorsements in NCEA from Deputy Principal Katie Spraggon.